No matter how well-organized and committed you are to your work – chances are that you might have spent time on things when you should have been spending time on some other important projects. 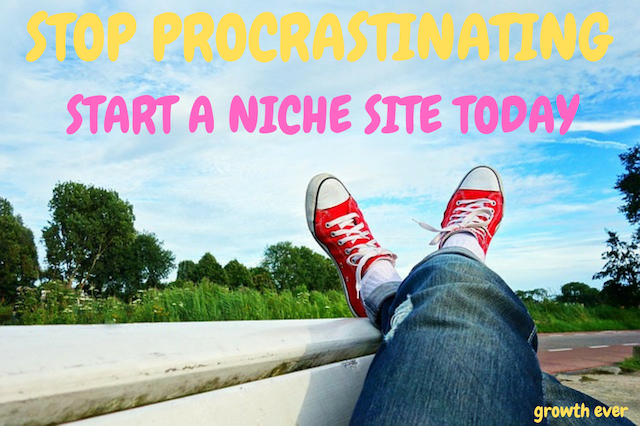 In this article, I am going to tell you why you should stop procrastinating and go head with your first niche site today! Just imagine how awesome would it feel if you are able to make few hundred dollars every month by doing something that you love. Or just imagine that you are going to bed with a thought in mind that you don’t have any further debts to pay. Or your next trip will be sponsored from your part time income. Isn’t it? Welcome to the big world of blogging. According to a poll done by Gallup in the US in 2017, around 85% of Americans hate their jobs. Just look at the number 85%. It’s whooping. This means that about 85 in every 100 people dislike their jobs. Most of us do jobs that we don’t like just to earn bread and butter for our family. Why not do something that we love and enjoy. I have seen someone having a huge interest in photography doing coding in a 9-5 job. Someone having a passion for coaching doing an odd job during the day. Someone passionate about architecture working with an accountancy firm. People fail because they to do not follow their heart. As someone says, “We are not living our dreams, we are just living our fears”. This holds true in today’s world. There are a lot of ways to earn money today. Blogging, indeed, is one of them. If you are not going to work for your dreams, who will? Plan: Lay initial foundation stone of your dreams. Just think. Do I want to start a blog? If yes, on which topic? Am I willing to put in a small minimum investment of $200 to pursue my dreams? What if I fail? Will I stand again and work again on my dreams. As someone has said, I don’t say I have failed 1000 time. I know 1000 reasons that can cause failure. Am I am willing to put in hard work and time on my blog? Act: Execute your plan. Spend some money on a domain name, hosting, email service. If you afford a bit more, try taking some courses. They will help you to move towards your goal fast. Grow: Treat your blog like your baby. Love it and take care of it. Post awesome content, build relationships, grow links and results will follow. Monetize: One traffic starts coming, its time to monetize your blog. You can try out ads, affiliate marketing, sponsorship to begin with. Once you become an expert, you can try your hand on creating a course. The only thing that stops you from achieving your dreams is only you. Blogging is so easy to start and require such a little investment. Unlike another business which requires a huge upfront investment and failure might you put in jeopardy, blogging is not like that. It requires little investment (under $200) and of course hard work, patience, and time. Starting a blog is no big deal. Getting traffic on your site is. Today there are thousands of blog on each topic. 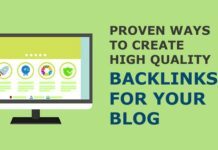 You need to choose a topic where you can write quality content and that has some space for you to grow. You must have a strategy once you decide to proceed further. Strategy, in the sense, which long tail keywords will you target, how are you going to bring traffic, which guests posting sites will you target, how are you going to analyze competitors links, how are you going to monetize your blog, would you allow guest posting and many more. You need to have blogging roadmap ready before you move deeper into it. Just understand one thing: results will take time. They won’t come overnight. I told you earlier that blogging requires patience. If you are thinking of blogging as a quick money making tool, you are in the wrong place. You should better apply for survey bases websites or teach English to students or become a virtual assistant that pays in a short time and has a limit on how much you can earn. 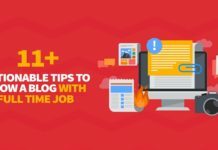 There is absolutely no limit on how much you can earn through blogging. I have seen top bloggers earn as much as more than 100,000 per month. That is a big dreamy figure for most of us. But again nothing is impossible. Everyone who is earning today from blogging started from zero. That’s the truth. You can also be the next millionaire. Just follow your dreams and put in hard work. Don’t give it a half-hearted try. People do make mistakes and you are bound to make it too. Nobody is born perfect. I took made mistakes and even today mistakes do happen. But this is not a reason to worry. If you have never made a mistake, that means you have never tried anything new in life. Starting a niche site on a topic and growing like it your baby will allow you to reap fruits in the future. A niche site is not at all difficult to start. 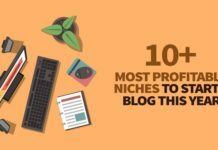 Here is a step-by-step tutorial that I wrote some time back on how to start a niche site. A niche site revolves around a topic. You need to pick up a niche that you are passionate about or you are knowledgeable about it or you are eager to further explore it. Whatever it be, setting up a site is not a big task at all. When I started my first niche site in the year 2009, little I knew that I could make money from it. It all started as a hobby and later became my full-time business. Sitting for long hours in front of my laptop became a normal thing for me. The traffic didn’t come initially and I almost gave it up. But then I looked at other bloggers who were sticking around and trying to make a buck. I didn’t lose my nerves then. I kept on posting awesome content on my website. It took 6 months and in January 2010 I earned my first couple of dollars online. I still remember that moment when I opened my Adsense account. This is what I saw “Estimated earnings: $2.43”. Voila! Really. I made my first couple of dollars online. That feeling was awesome. Those couple of dollars pumped in 2000 volts of energy in me and I started posting more awesome content on the site. To keep things short, blogging has made my life so amazing. Blogging has helped me to connect to millions of people across the world. Today I can afford things that I was hesitant to buy earlier. .